“Fenway Park, in Boston, is a little lyric bandbox of a ballpark,” begins the tale of Red Sox slugger Ted Williams’ final at bat on September 28, 1960, at the oldest major league baseball stadium currently in use. Some people can write, and John Updike is one of them. Thanks to the Library of America, contemporary readers can now rediscover this treasure on its fiftieth anniversary. The original essay appeared in the October, 1960, edition of The New Yorker. This collection features the original essay plus footnotes Updike added when the piece was included in a 1965 compilation entitled Assorted Prose. 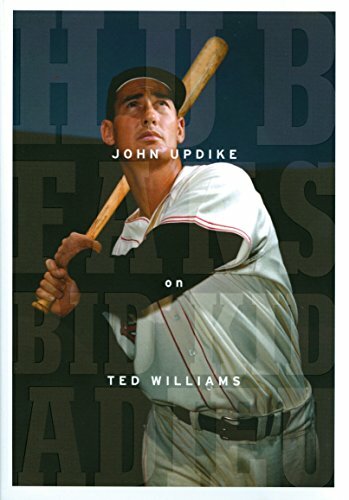 Also included is a chapter entitled “Ted Williams 1918–2002,” parts of which appeared in various magazines between 1986 and 2007, and a preface from Updike penned in January of 2009 specifically for this release. This book is a no brainer for baseball fans. Sit outside some evening, turn on the radio and listen to your favorite broadcaster capture the imagination with the description of your local team’s exploits, open up this book, and before the third inning begins, you will be finished, wishing there were more. Updike does not so much attempt to dispel the stereotype of Williams as a surly character, disagreeable to fans and media alike, nor does he heap adulation on the man indiscriminately. Rather, he successfully portrays this complex man, warts and all, for what he is—arguably the greatest hitter who ever lived and indelibly connected to the game he played and the city in which he played it. Some of Williams’ greatest moments are described, along with the equally disappointing failures to which his detractors so eagerly point. In 32 sparse pages, a rich picture emerges of life and death, free of sentimentality, yet filled with human emotion. A fighter pilot, Williams missed five years of his prime to two different wars. He is still heralded for his amazing eyesight, which translates on the field into the reason why he is most remembered—as the last person to hit .400. Assuming he had not been injured, Williams, who walked a great deal, would have amassed another 2,500 or so additional at bats. Despite this, he still finished his career with 521 home runs—tied for eighteenth all-time, but tied for twelfth on my personal list—the last one coming majestically on the final at bat of his career. At a pace of one home run every 14.79 at bats, his average, Williams would have clobbered 690 home runs, a solid third on my list. Each individual can create their own list of all-time greats, but regardless of where Williams specifically falls, it will be somewhere very near the top. His greatness cannot be debated, nor can the aplomb with which a truly great writer captures it.